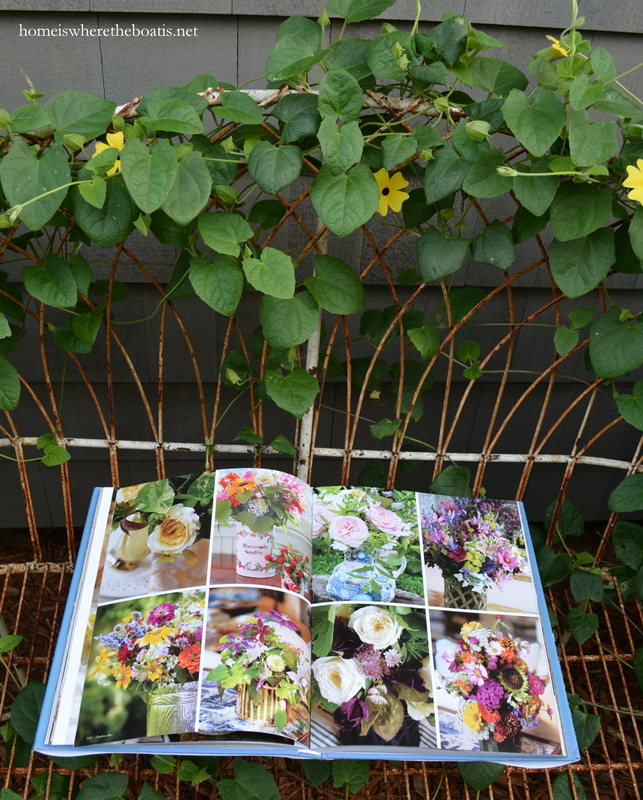 Florabundance and A Flower Fix: Perennial favorites from my flower bed of inspiration and their blooming pages! 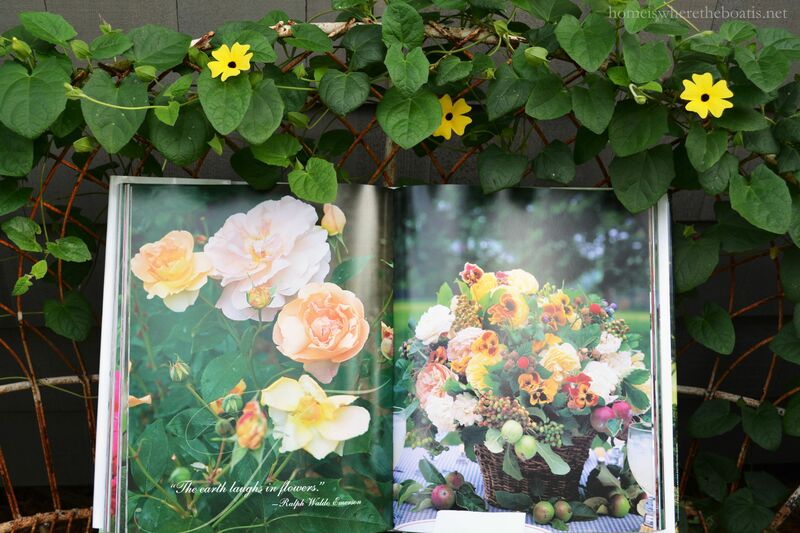 I’m joining Jain, at a quiet life, playing with books and sharing some perennial favorites, full of florabundance! You may have noticed I have a ‘thing’ for flowers . . . In arrangements with the fruits of the season. . . In dishes and in jars. 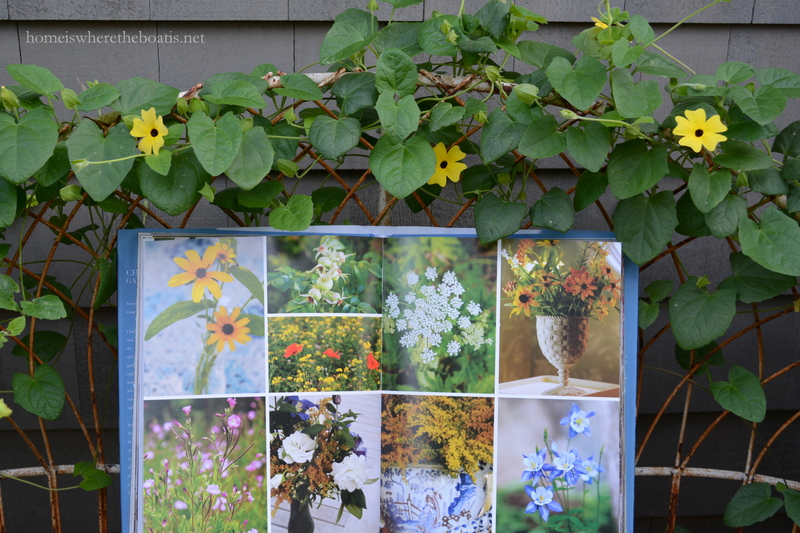 I’m sharing some perennial favorites from my flower bed of inspiration and their blooming pages! I can’t begin do all these books justice in one post so I’m highlighting three of my favorite books. 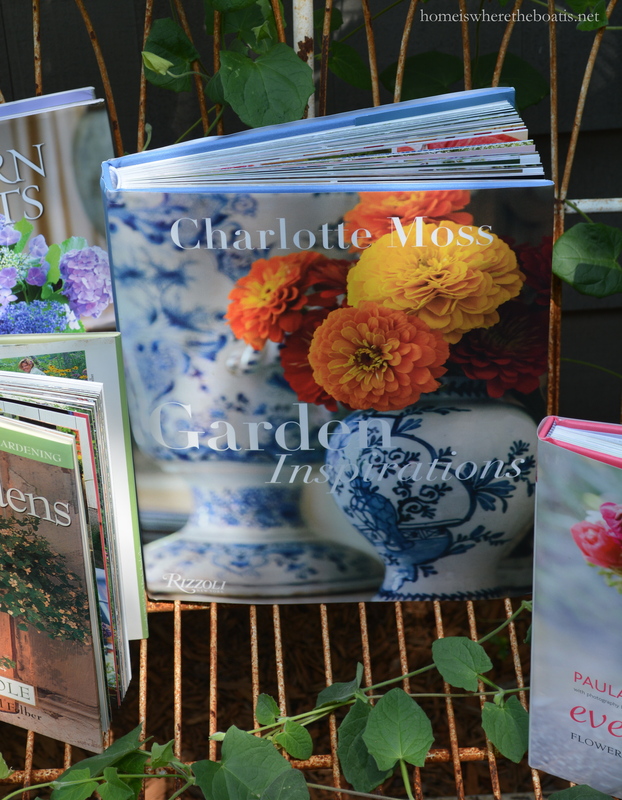 Starting with a book out this spring and full of beauty and inspiration, Charlotte Moss: Garden Inspirations. Celebrated interior designer and renowned tastemaker Charlotte Moss turns her eye to the garden as a resource for interiors, entertaining, and good living. 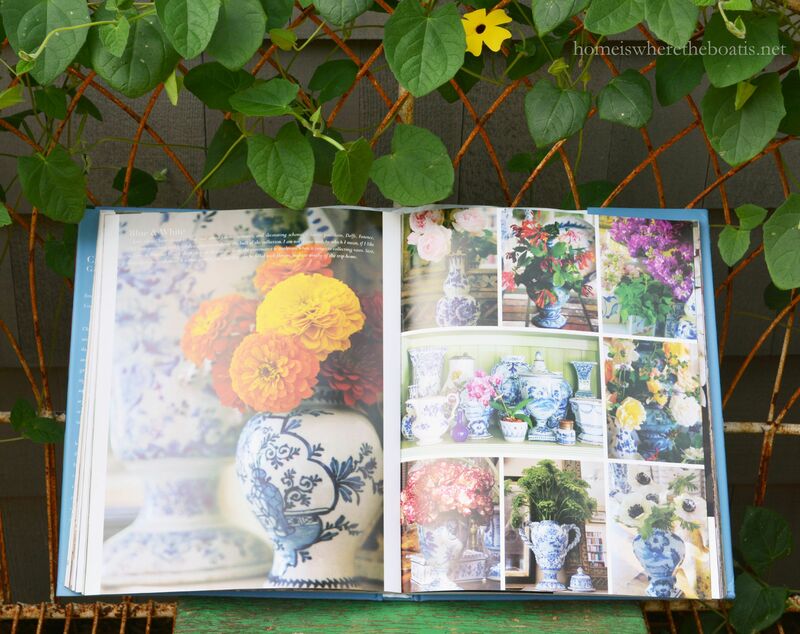 Charlotte Moss’s greatest muse is the garden, and this book shows the myriad ways the garden provides inspiration every day—indoors and outdoors. 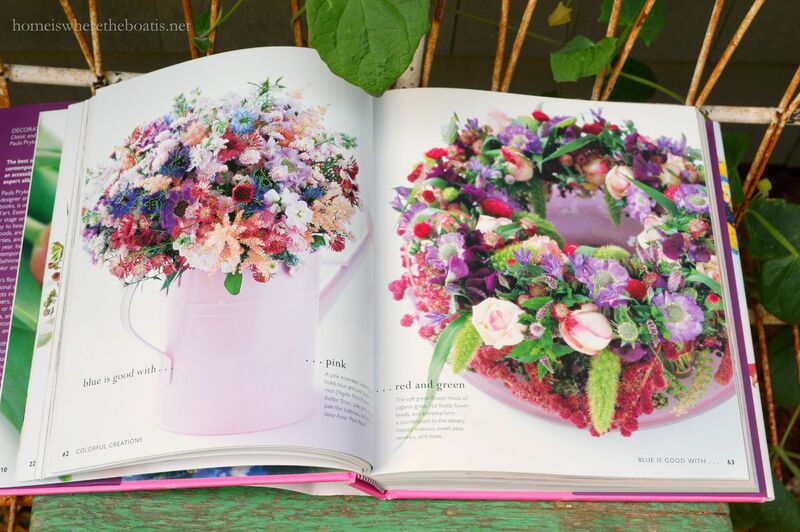 Touring readers through her own gardens, Moss offers insights on how to bring the garden into home life—including ideas for elegant flower arrangements from the garden and the table settings and menus they inspire, garden seating for entertaining and relaxing, interior color schemes drawn from nature, and much more. 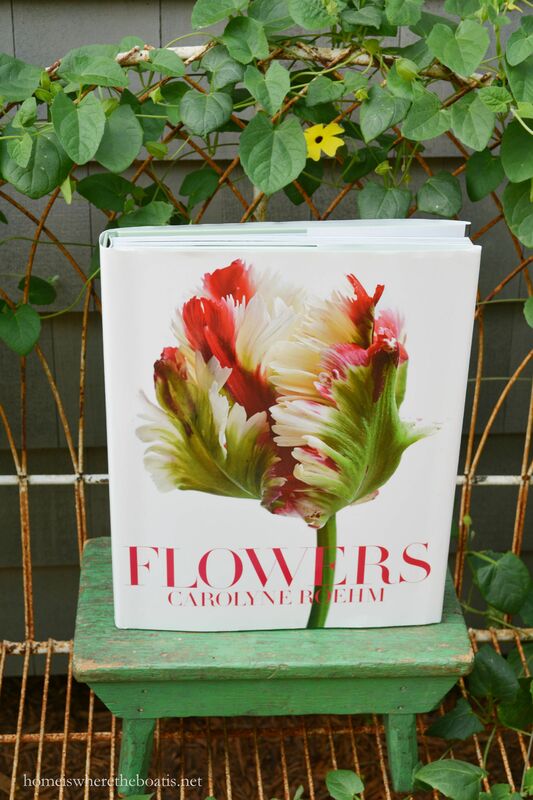 Flowers by Carolyne Roehm, a flower garden in a book! Big, beautiful and lush with large pages and over 300 photos in vivid color. 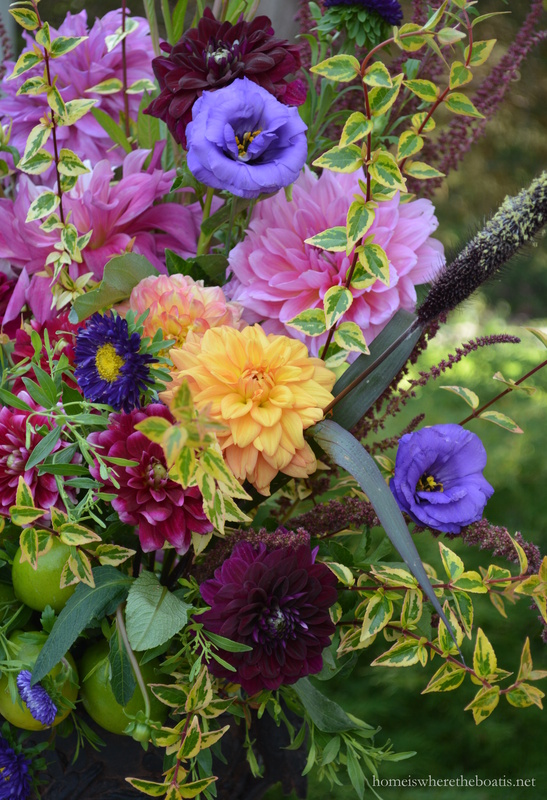 With a gardener’s intimate understanding and a designer’s elegant eye, Roehm shows the flowers she has cultivated for decades in and around Weatherstone, her historic Connecticut home. 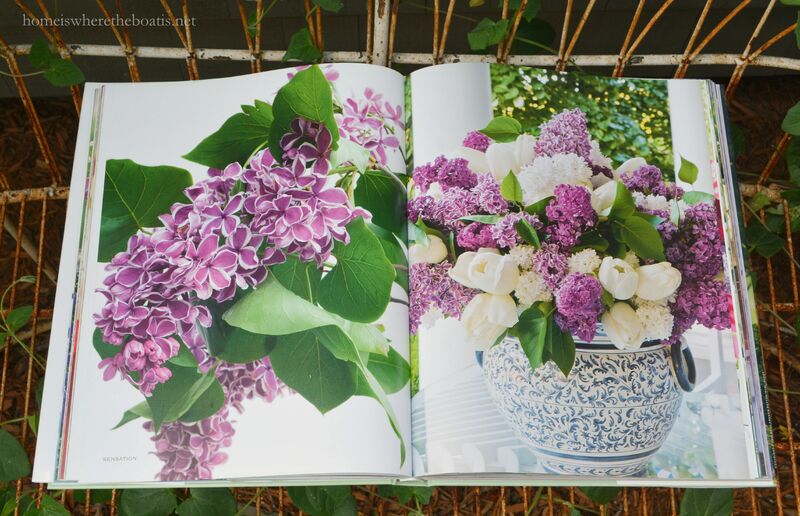 While alternating dramatic close-ups with portraits of lovely arrangements and sweeping views of her land, Roehm writes with wit, emotion, and affection of what flowers have meant to her, as well as of the joys and travails of the committed gardener’s life. 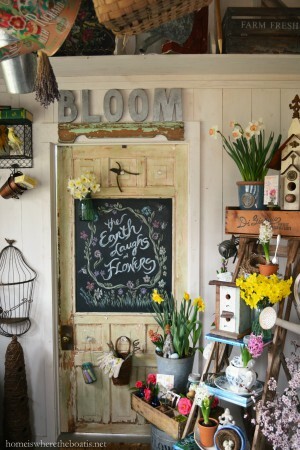 “The earth laughs in flowers” – a favorite quote for some chalkboard inspiration. 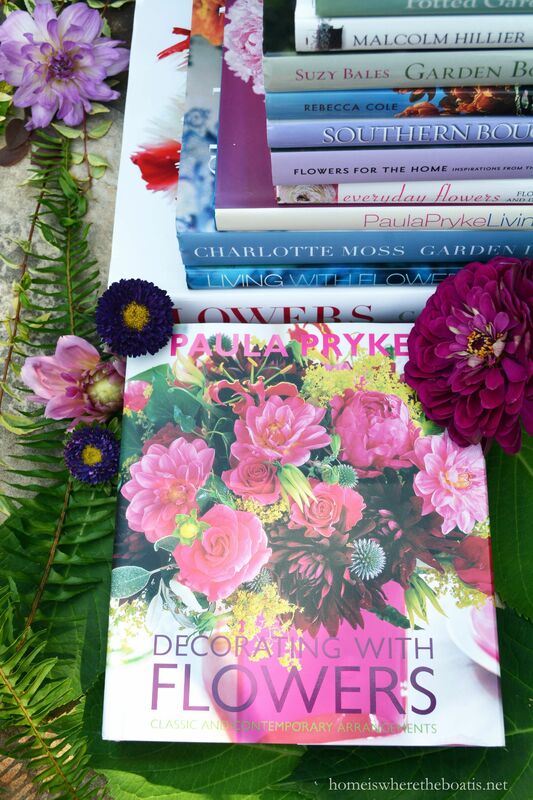 I’m a big fan of Paula Pryke, Britain’s acclaimed master floral designer and author of numerous bestselling books. 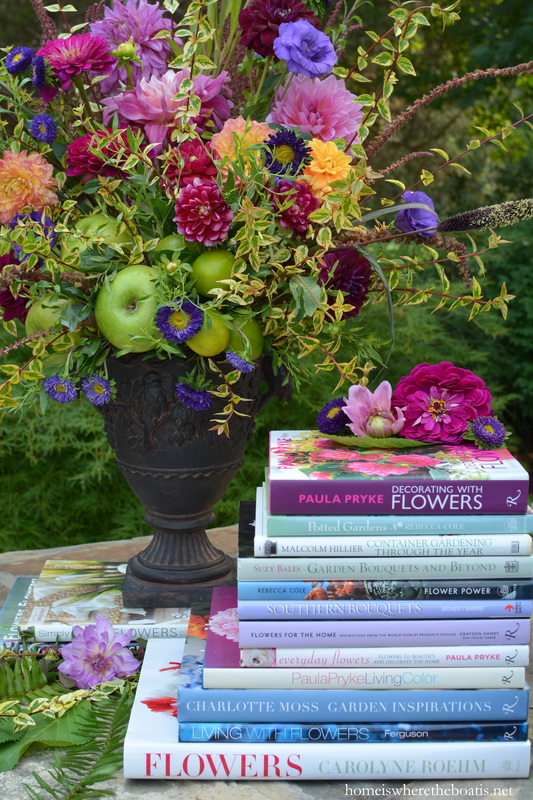 Paula Pryke’s floral artistry goes beyond the traditional arrangement-in-a-vase—her signature concepts include using nontraditional containers, unexpected accessories (e.g., candles or fruit), combining unusual colors, textures, and architectural forms. 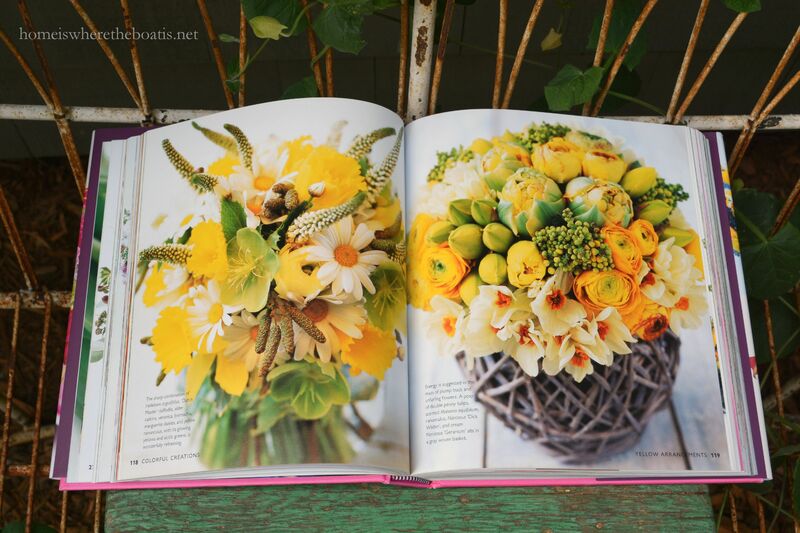 Packed with ideas, skills, and techniques, this book explores the latest trends in floral design for any season and encourages readers to let their creativity and personal style flow. 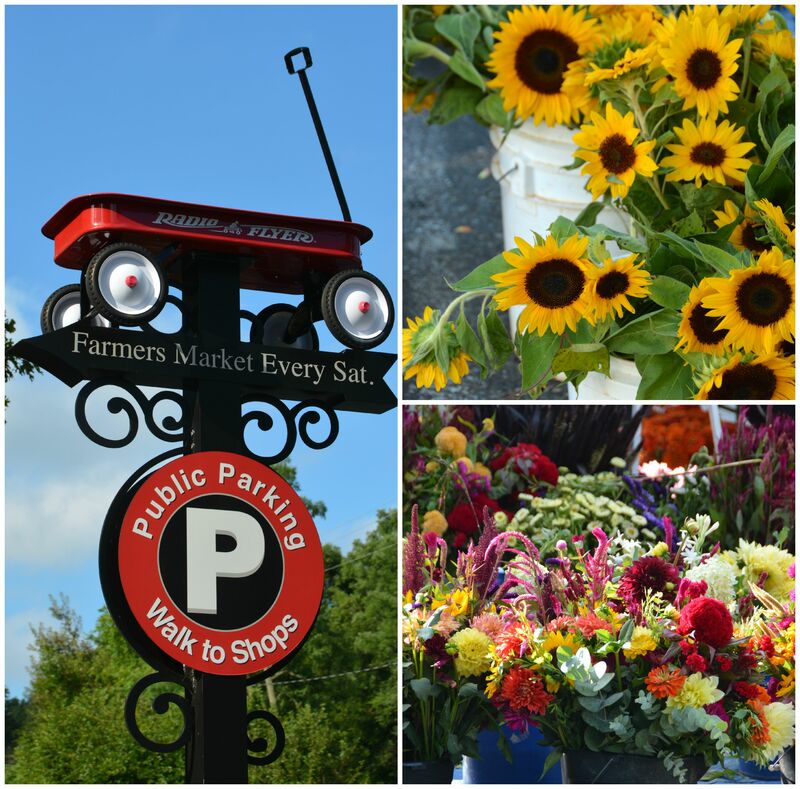 I picked some flowers at the Farmers Market for flower fix. 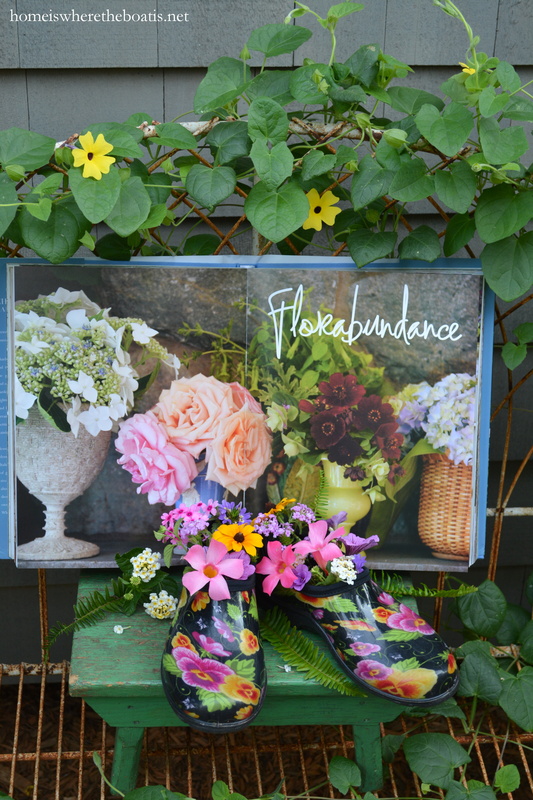 . .
A cheery summery bouquet and guaranteed spirit lifter for the August blues that comes with a long summer of heat and humidity. I stripped the leaves that would be below the waterline, removing the excess foliage, and damaged petals and recut the stems at a 45 degree angle for maximum water uptake. I placed them in a clean bucket with room temperature water and some floral preservative to condition them and let them sit overnight. I used the “float soak” method and placed the floral foam bricks on the top of a solution of fresh water and floral preservative. 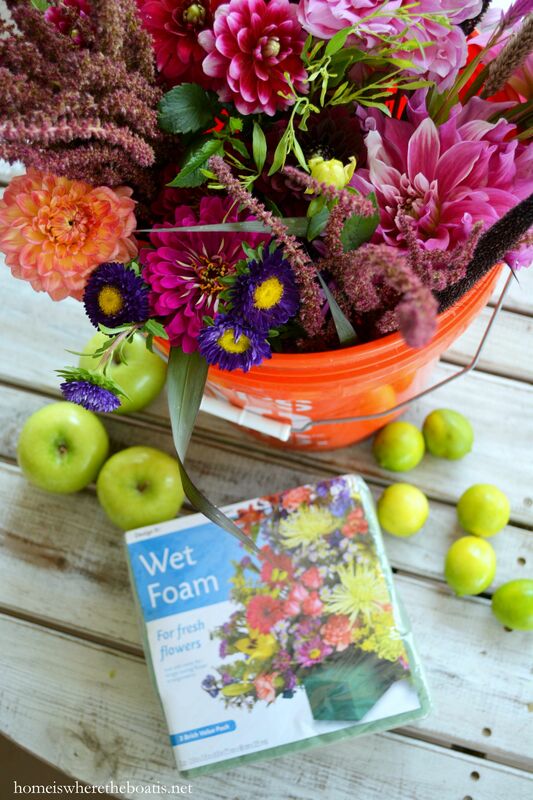 You find see a diagram and directions on how to soak your wet floral foam correctly here. 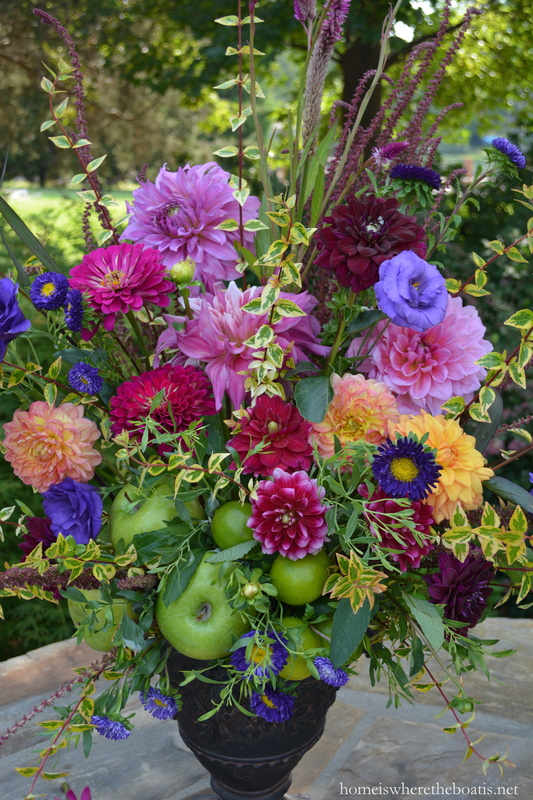 I added some apples and limes with floral picks for filler and punch of green to go with the bright pinks and purples of the dahlias, asters and lisianthus to the arrangement. 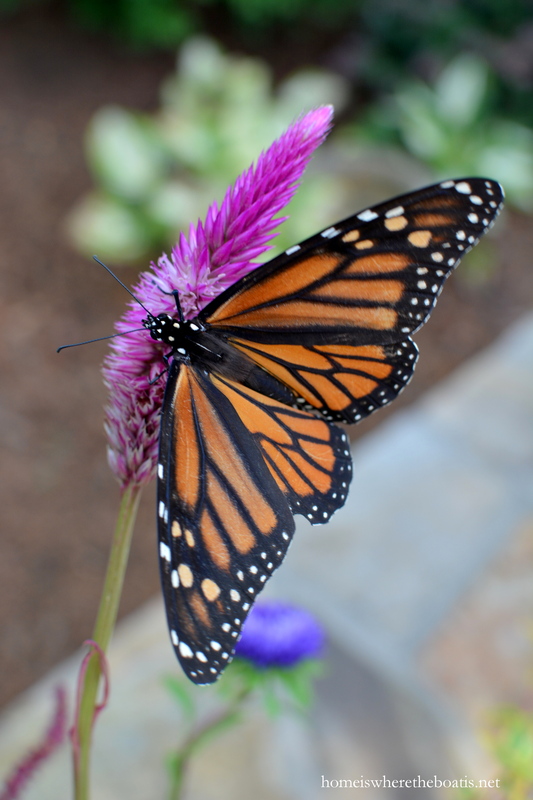 I thrilled to have a surprise visitor while I was taking photos of my flowers . 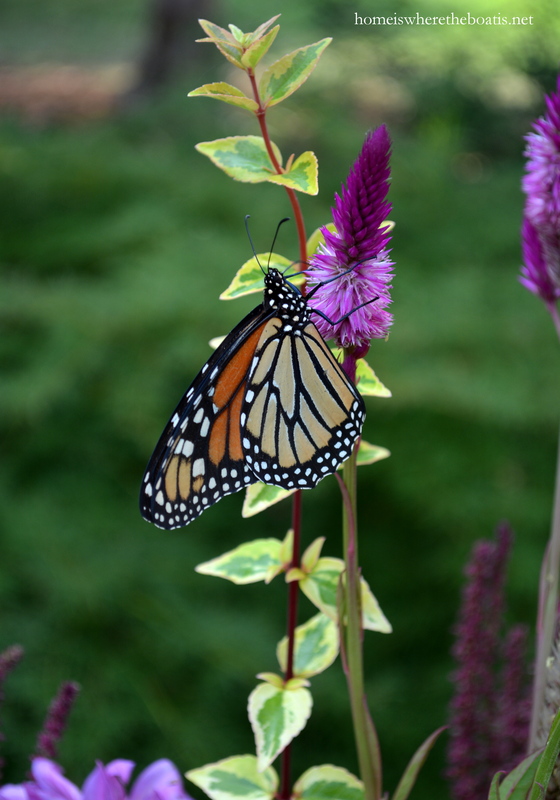 . .
A monarch butterfly dropped by for a little nectar sipping from the pink spikes of celosia. Hope you’re surviving the heat and finding a way to beat the August blues! Just breathtakingly beautiful, Mary! Each photo should be a Hallmark greeting card…or better yet, a screen saver for the computer in winter!! Simply beautiful! I was out early this morning cutting flowers and herbs from my garden as well! Though nothing in comparison to your beautiful arrangements, I love the simplicity of a mason jar filled with fresh herbs and and a few garden flowers! It smells heavenly in the kitchen!! I adore your work and don’t know how you do it all, but keep it up!! You always seem to start off my day on the perfect note….I have been scanning up and down on this post, taking every bit of beauty in….your arrangements and your wreaths are just incredibly beautiful….I love arrangements with flowers and fruit….you are such an amazing inspiration….gotta pin and share….I can see why the butterflies gravitate to your gardens…they know where they can have a beautiful day! Outstanding! What a beautiful post! So pretty! A lovely way to wake my eyes up first thing in the morning. P.S. 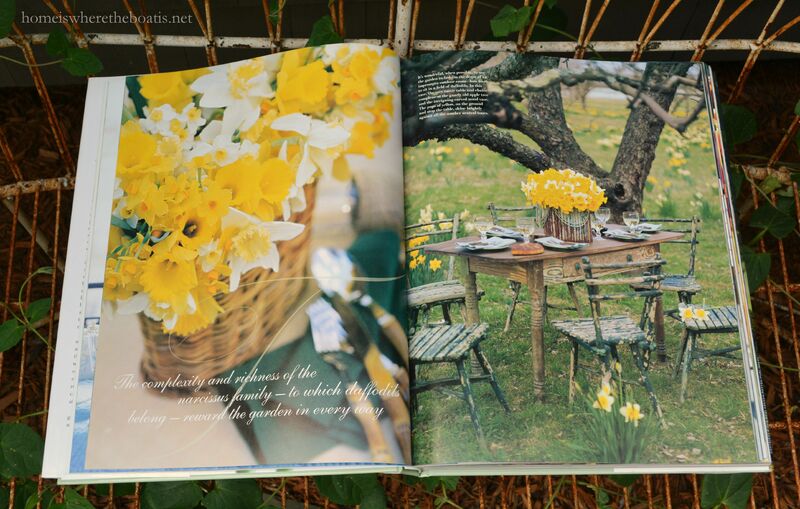 Mary, your photographs truly belong in a book!…. Breathtakingly beautiful! Thank you for brightening my day. 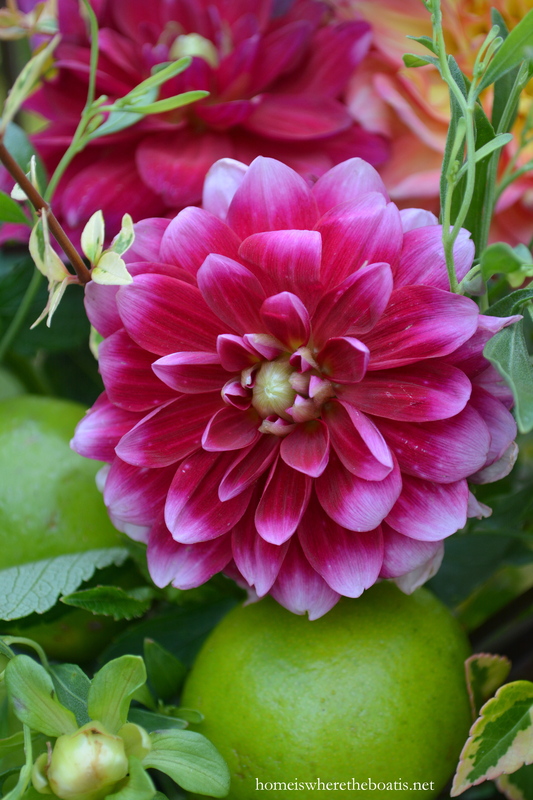 *sigh…so happy to see that somewhere in this country, there are still beautiful flowers blooming. Mine burned up a few months ago 😢. But you have uplifted me this am. 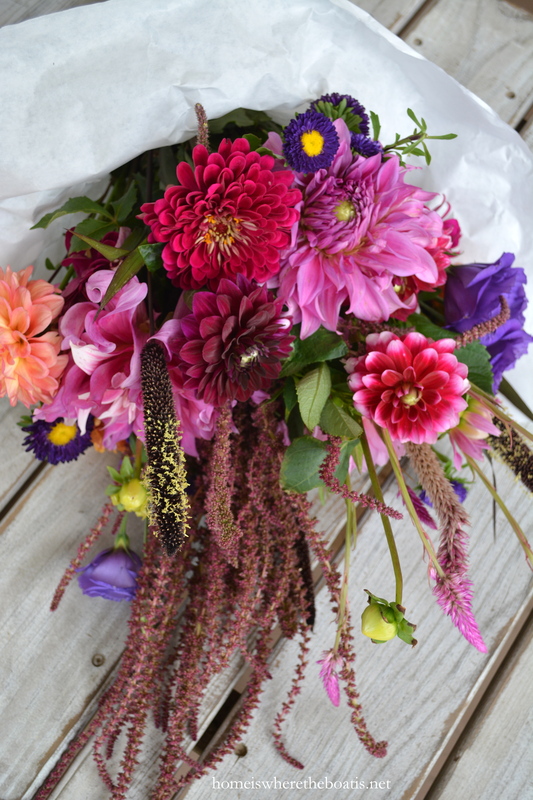 Off to the flower shop I go….a pretty bouquet in my kitchen is just what the dr ordered!! You’re an excellent student, Mary, in learning all you can from your favorite books on flowers. Thanks for your beautiful photographs and all your tips. where do i begin, as i twirl from season to season, lush rich flowers, tantalizingly beautiful books and more gorgeous vignettes, its all just a whirl of perfection! 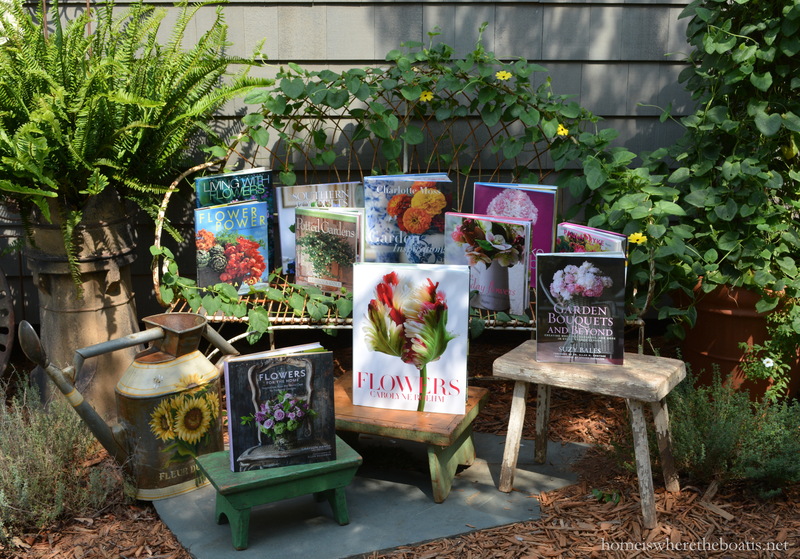 adore the shoes flooded with happiness and urns of joy, but seeing your books all placed in the garden is swoon worthy for this garden bibliophile! thanks so much for joining the challenge, you made my heart soar! Mary, your work is absolutely stunning! If you were to ever publish a boo,k I would certainly buy it! I love starting my day with you posts. Love the quote by Carolyn Roehm. I wish I had the (right) property for a garden, but at least I do have a side yard that can now be planted as it’s (finally) level to s certain degree. Mary, I loved each picture. The blue hydrangeas with the orange mini pumpkins really made me linger. Mary – you are so inspiring. I look forward to your blog everyday but this one – outstanding! I love the hydrangeas with the mini pumpkins! Thank you for these beautiful images. Each is a true gift. Oh! Mary, this made my eyes prickle it is all so very beautiful. Did you raid my bookshelves! Love Paula Pryke’s books and have several others which you mention. 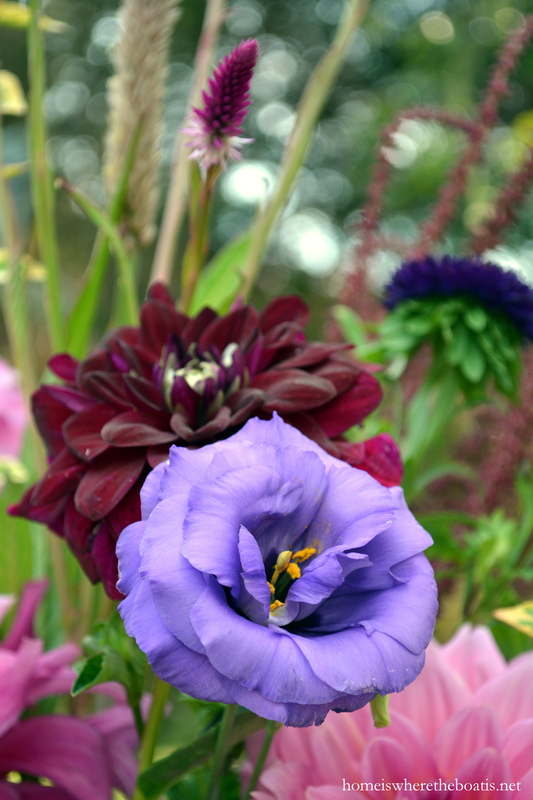 Books and Flowers and Gardens – I am a hopeless addict. I look forward and enjoy all of your wonderful posts, bu this one, fellow addict, is a lot more than just Glorious and I am keeping it! I am so grateful for people like you. Did I mention that your Shed is stupendous? Those photos are so beautiful! What is the vine with the yellow four petal flower on some of them? All your photos are wonderful and you always have a few stunning ones here and there…You never disappoint, Mary… My cup runneth…. 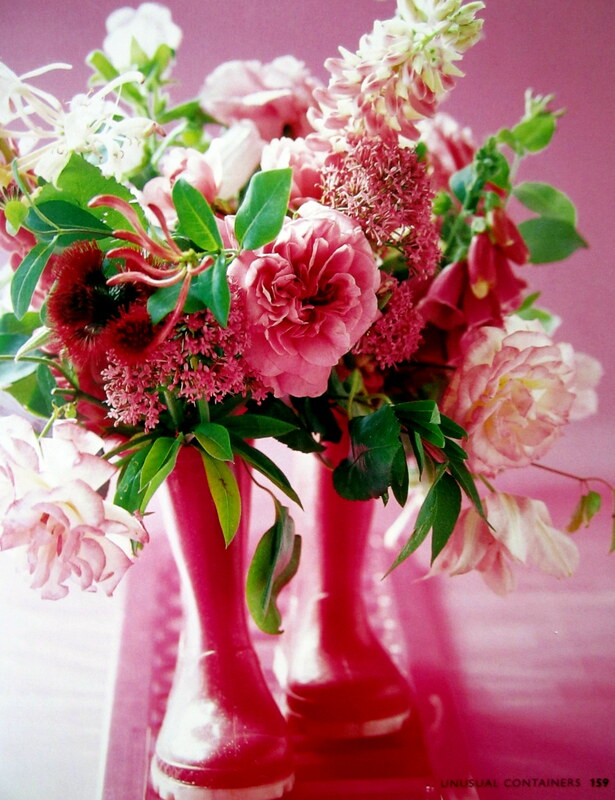 Outstandingly gorgeous – your floral arrangement! Absolutely gorgeous! You take the best photos ever – might you be a professional? Oh that I could capture beauty the way you do….. 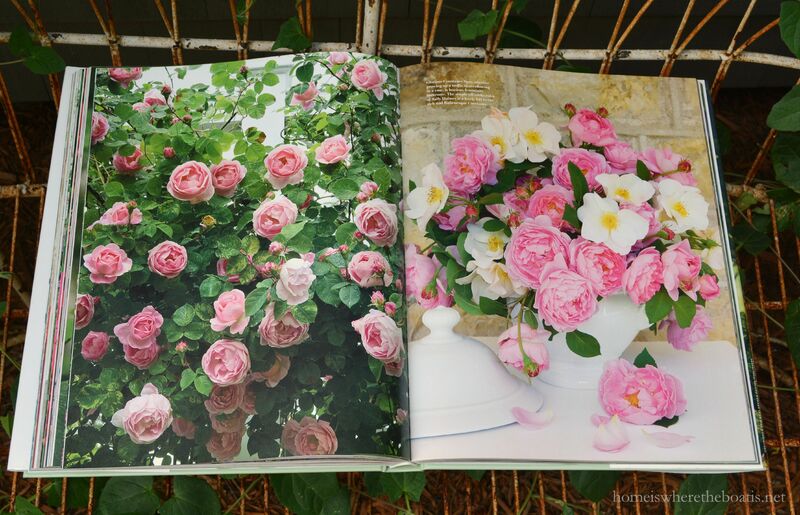 Your flower pieces and those in the photos of the books remind me very much of the old masters, so beautiful! Mary, your arrangement is glorious! I rarely take the time to actually arrange flowers. I usually just prepare a bunch and pop it into a container. 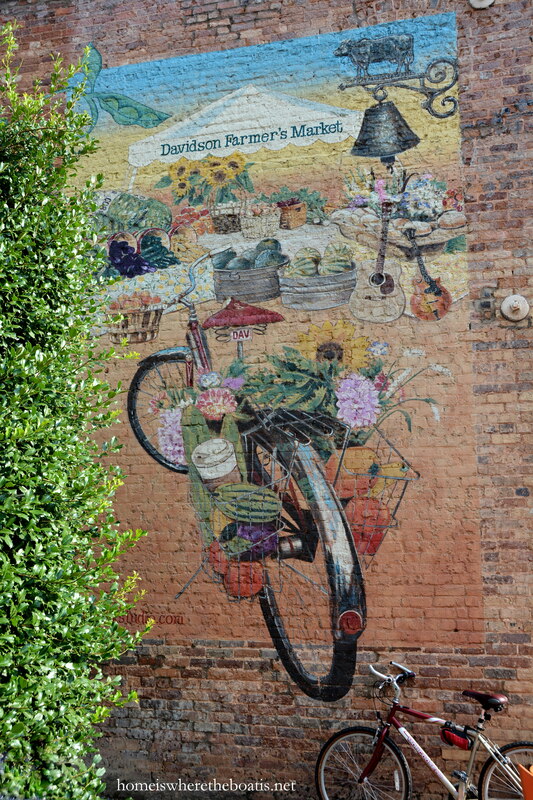 Love the idea of adding fruit and veggies like you did. I need to get more creative. You and I share a love of flowers and many of the same titles. 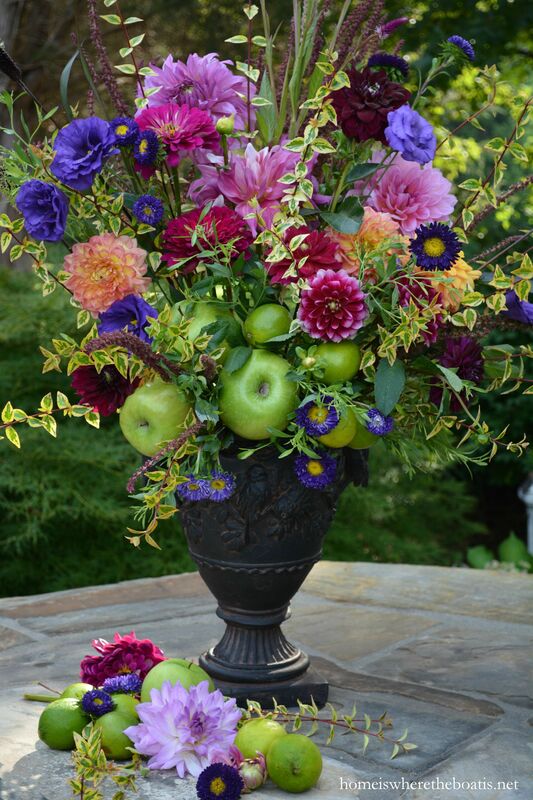 I recently gave my Carolyne Roehm to a young friend in the floral business. I was packing things for storage and felt she would make good use of it. I may just need to replace it. It’s a gorgeous book. I adore Charlotte Moss’ new book. She is such an inspiration! Wow! What a beautiful post! 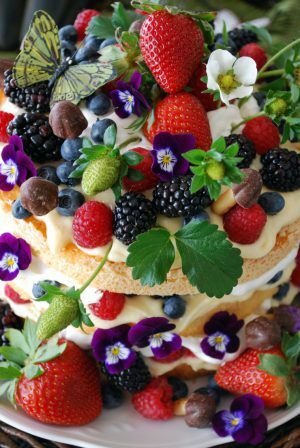 I can’t add much to what everyone else has already said…you are extraordinarily creative in so many arenas…you have a beautiful sensibility.I want to devour every dish you prepare, sit at every table you set up and fill my yard with everyone of your floral creations. You are a gifted person and I love to visit. Mary: Oh, my gosh! This post has deeply touched the part of my soul that craves beauty in Nature! Truly, I think this may be my favorite post ever, and that’s saying a lot, because you do such phenomenal work! Martha Stewart ain’t got nothing on you! Please let us know when the networks decide to sign you up! 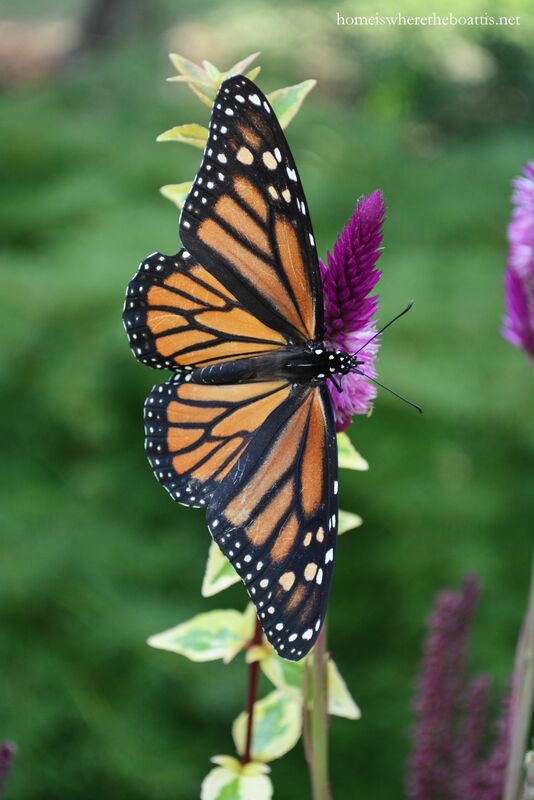 How thrilling to have two sightings of a monarch butterfly. I would be thrilled too! It’s been years since I’ve seen one. I had a spicebush swallowtail and yellow eastern tiger swallowtail this weekend. I love this post. 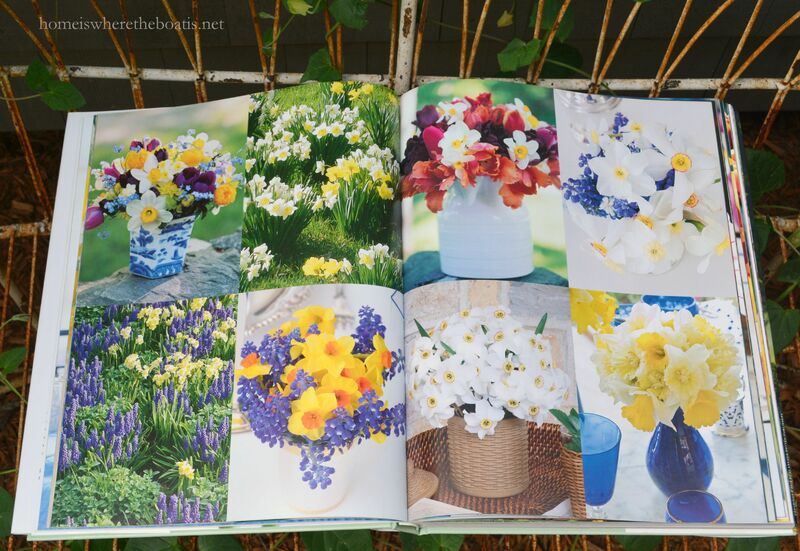 I love flowers and beautiful books ( although I’m running out of room) so this post is high up on my list. I swoon viewing these gorgeous arrangements. Your creativity never ceases to amaze me. I agree with the comment above. 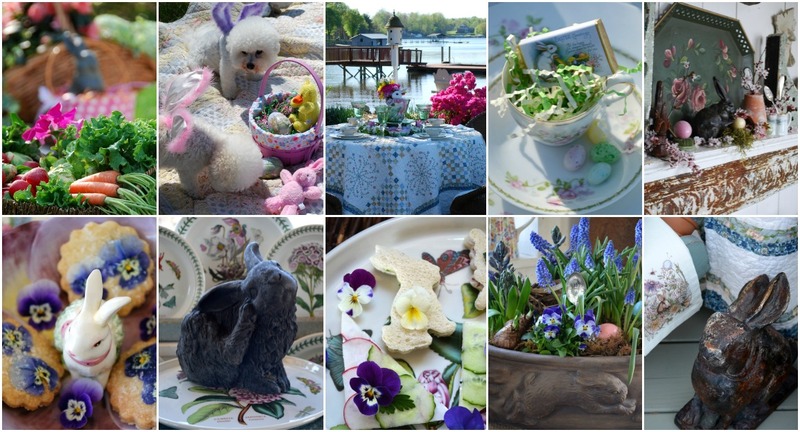 I’m going to forward the link to this post to my Garden Club. No cable, phone or internet yesterday so I am late to this party but so glad I made it!! This is magnificent!!! I am going to look for some of these books. You would think I would have them but don’t!? 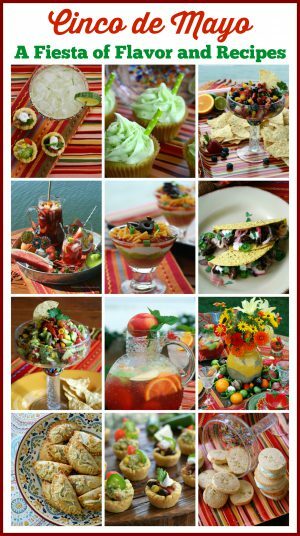 Your arrangement is beautiful as are all the pictures in this post. I come here and am always refreshed and HAPPY!!! Hate to leave but do revisit many posts. Will SAVE this one!!!! I agree with Shirley. 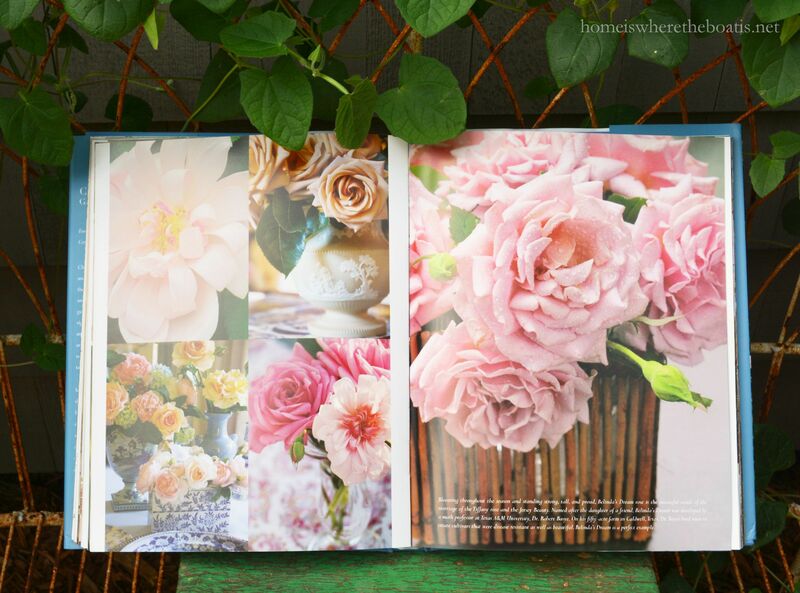 Have you ever thought about publishing a book of all of your stunning photographs? You are so talented! 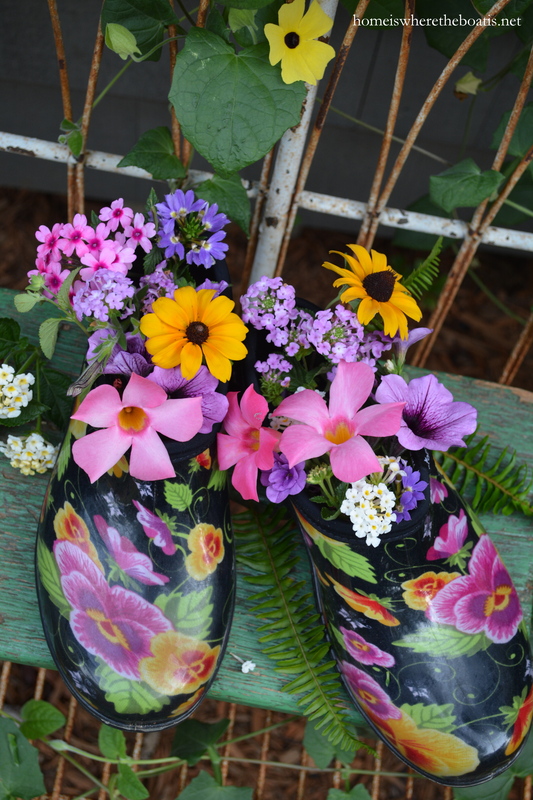 Good golly Miss Mary…these are floral fantasy fabulous!!! My gosh, this is a gorgeous post. 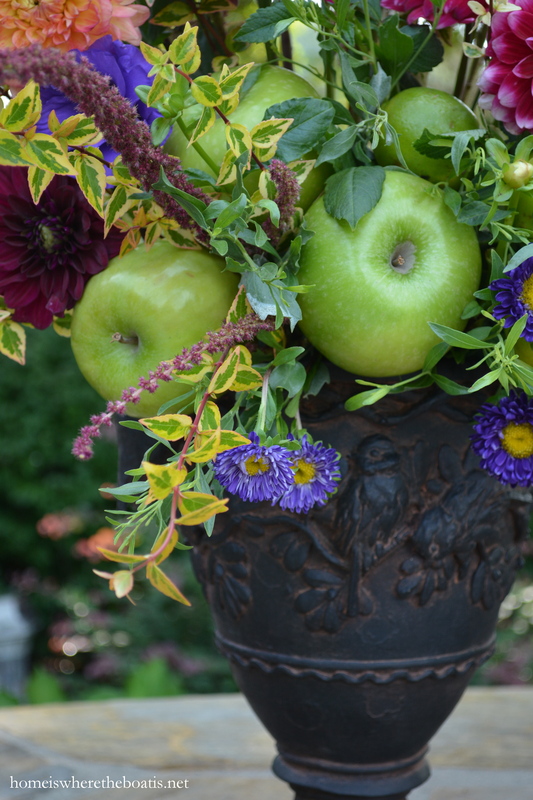 I love the fruit and vegetables in your lovely arrangements and yes taking pictures…does keep the memories fresh, but the smell of dirt in gardening or the scents of the flowers, just have to linger in your mind…Close your eyes…breathe deep! LOVE everything here, you are an ARTIST! 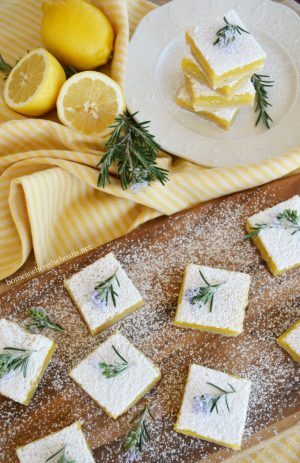 Such a gorgeous post Mary! Thanks for joining Home Sweet Home! There are so very many beautiful photos! I love those shoes! Where did you find those? Have a beautiful day!